Richard Kempson was a prominent member of the East Oxford community and had a significant involvement in the development of the area in the late 1880s and early 1900s. He was a builder by trade and many of the houses in the area, principally in Howard Street and Hurst Street were built by him. Richard’s practice was to borrow money to finance each house as it was built and repay the mortgage with the rent it produced In this way over the years he built well over 100 houses primarily in East Oxford with a few at Headington. Richard was born in St Clements, Oxford on 29 July 1844. He was the seventh child of John and Maria Kempson. John had been a stone mason born in Broadway, Worcestershire. Richard was just 17 years old when his father died. He was initially a carpenter and later progressed to be a master bricklayer and builder. In 1874 Richard married Ellen Thornton and they had four children. The first, Alice Katherine, died in infancy. There were two sons, Archibald Richard, and Frank (born 1880), and one daughter Agnes Ellen. The two boys joined their father in his building business with Archibald as a carpenter and Frank as a bricklayer. In 1881 the family were living in Henley Street and later moved to Hurst Street. At one stage they lived at No.78 Hurst Street and that house was subsequently occupied by Archibald and his family. A plaque can be seen on the front of the house identifying it as Eason Cottage – Eason being the maiden name of Richard’s mother, Maria. Richard and Ellen moved to No. 89 Hurst Street in the early 1900s and remained there until Ellen’s death in 1922 and subsequently Richard's seven years later. Apart from his work as a builder Richard was very active politically and socially. In 1889 he stood as a Liberal Candidate for the East Ward and was elected a member of the City Council. He served on the Council from 1889 to 1908 and during 1902 was Sheriff of the City. During his term of office as Sheriff he represented the City with the then Mayor, Sir Walter Gray, at the Coronation of King Edward VII. At the time of his death Richard was referred to in the Oxford Times as “the man who refused to be Oxford’s Mayor”. The office of Sheriff was normally the prelude to becoming Mayor but Richard declined the invitation to become Oxford’s chief citizen. It is believed that this was principally due to the declining health of his wife Ellen who for many years was a partial invalid. In his early days Richard was a staunch trade unionist and was the secretary of the local Amalgamated Society of Carpenters and Joiners. He was a very active member of the Liberal party and as such a founder member of the East Oxford Liberal Group. His sympathy for struggling wage earners was always practical and on the Council he was a pioneer in the allotment movement becoming a guarantor in helping to form the East Ward Corporation Allotments Association. He was a keen supporter of the East Oxford Cricket Clubs. Agnes married Walter Bruce, a local tailor, and they lived in a house at the corner of Leopold Street and Hurst Street. Adjacent to the house was kept the family pony, Billy, and two traps. These were used for many family outings. The pony and trap is shown in the photograph below which was taken around 1915. A tired looking Billy is proudly held by Richard’s grandson, Roy, together with six of his granddaughters. The house was subsequently replaced with a group of flats. 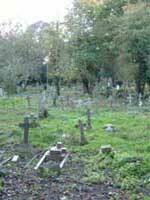 Richard Kempson died on 17 February 1929 and was buried with his wife, Ellen, in St Mary & St John’s churchyard (C14). Also buried in the churchyard are Richard’s daughter and son-in-law, Walter and Agnes Bruce (C116), and both of Richard’s daughters-in-law, Gertrude Florence (wife of Archibald) (C7) and Katherine Emily (Kate, first wife of Frank) but this grave has not been located. Agnes Kempson married Walter Bruce on 20 Sept 1899 at Ss Mary & John Church. Walter was a tailor and he had a display case showing a sample of his work at the front of his house on the corner of Leopold Street and Hurst Street. This can be seen to the left of the trap in the photo above (under the Kempson family). Walter was one of the younger children of Thomas and Priscilla Bruce. Thomas Bruce was a local publican and licensed victualler (in the 1871 census he was described as a whitesmith and publican) and from 1870 until his death in 1883 (aged 43) was licensee of the New Inn at its original location of 52 Cowley Road. After his death in July 1883 (he is buried in the churchyard: D109), his widow Priscilla married Frederick Joseph Valentine Hall in the Marylebone Registry District in the December Quarter of that year. The 1891 census shows them living at the New Inn, where Frederick was then the innkeeper, together with three of Priscilla's children: Frank, Walter and Emily Bruce. In 1895 the license of the New Inn was transferred from its original location at 52 Cowley Road to its new position at 119 Cowley Road. Frederick Hall died in 1897 and the 1901 census shows that the publican/ licensee was now John Bruce, the second son of Thomas. Priscilla was living with her daughter Emily and son in law John Benson at 38 Divinity Road. Walter died aged 68 in 1945. 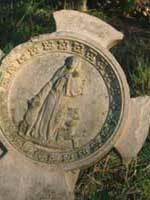 Agnes had died aged 63 in 1941 and they are buried together in the churchyard (C116). Walter’s younger sister, Annie Bruce, who died in 1889 aged just 21 years, is buried in the same grave (D109) as her father. Frank Bruce, the fourth son of Thomas and Priscilla, was a tailor like his younger brother Walter. He married Emily Louisa Francombe, b. 1871, on 18 April 1892. In 1901 Frank and Emily were living at 42 Regent Street with their daughters Edith aged 8 and Annie aged 2. Emily is buried in the churchyard (B280). Derek Honey, Encyclopaedia of Oxford Pubs, Inns and Taverns, The Oakwood Press, 1998. William Yeates (1825-1915) married Ann Harvey (1825-1892) on 20 Jan 1849 in Warborough, Oxon. Their two eldest sons were were born in neighbouring Benson, Thomas, born in 1849, and George Harvey Yeates. Thomas Yeates moved from Benson to Beckley where he can be found in the 1861 census as a boarder at the Beckley Industrial School. In 1871 he was living at the Croft, Old Headington where he is recorded as a schoolmaster. He became the Master of Headington National School, which was then a mixed school, in January 1871, and continued in charge of the Boys when the Boys and the Girls School became separate in 1875. In 1877 Thomas moved to Sutton Courtenay School, Berks where he was the Master for nearly 40 years until his retirement in April 1916. Thomas married Harriet Hall (b. 1845) on 19 Aug 1873 in Beckley, Oxon. The census records the family living in Sutton Courtenay in 1881. Then the family household consisted of Thomas Yeates, a schoolmaster aged 31, Harriet Yeates aged 36, Annie aged 5, Katherine Emily (Kate) aged 2 and a baby sister Amy who was 5 months. A male lodger aged 17, from Headington, also lived in the household and was listed as being a pupil teacher. A nursemaid domestic help aged 12 was also recorded as living in the household. Thomas died in 1940 aged 91. Harriet died in 1893 aged 48 years, a year after her mother-in-law and 22 years before her father-in-law. Harriet’s daughter, Kate, married Frank Kempson in 1904. They lived at 45 Howard Street until Kate died in 1915. George Harvey Yeates (Thomas' brother) married Harriet Crozier in 1877 in the Headington Reg District. Harriet Crozier was the mistress of the Girls School when Thomas Yeates was in charge of the Boys School. Presumably George Harvey and Harriet were introduced to each other by Thomas. The 1881 census lists the George Harvey Yeates family as living in High Street in Headington with a one year old daughter Margaret. Two sons followed, William A Yeates born 1882 and Sydney born 1893. In 1891 and 1901 the census lists the family as living at 30a Bullingdon Road (recorded in 1901 as ‘Welcombe House’). George is recorded as a brewers clerk and Harriet as a schoolmistress. An obituary to Sydney in the 1955 City of Oxford High School magazine recalls that ‘he came of a much respected family in Oxford, already connected with teaching, his mother having been headmistress of the Cowley St John Infants School for many years’. 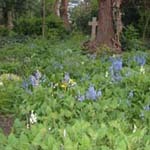 George died in 1921 and was buried in the churchyard (C20). After studying at Pembroke College Oxford, Sydney Yeates became a teacher. In 1920 he took up a position as an inspector of schools at Lagos in Nigeria. From 1923 until 1937 he worked first as an assistant head teacher, then he was promoted in 1926 to head teacher at the Grammar School in Tientsin, China. He returned to England in 1937 because of ill health and worked as the Headmaster’s Secretary at the City of Oxford School until his death in 1955.